Learn about the Dutch and how to speak Dutch! Wittenborg University Looks Forward to an Exciting New Academic Year as it Celebrates its Latest Graduates. Wittenborg University’s 2014 Summer Graduation Ceremony last weekend was a glamorous and joyful affair - distinguished this year by the fact that all graduates were female. University director, Peter Birdsall, also gave a glimpse of what stakeholders can look forward to in the next academic year. Birdsall said the past year has seen a growth in the number of students admitted to Wittenborg and a fall in the number of those students who drop out before graduation. The university ended the 2013-’14 year on a highlight with the news that it has received unconditional accreditation for its Master of Business Administration (MBA) from the German accreditation body, FIBAA. The MBA-course aimed at professionals wishing to upgrade their management skills will start in September and is open for admission now. The next decade or two will also see Wittenborg University expanding and dividing into five entrally managed, but independent schools: Business, Hospitality, Art and Technology and Education Birdsall said from September this year the university will slowly start splitting into a school of respectively Business and Hospitality. 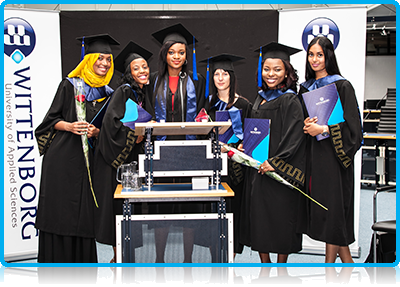 Currently, as part of its Master of Science programmes (International Hospitality Management, International Event Management, International Tourism Management) Wittenborg offers its students a double degree in conjunction with it’s UK partner, the University of Brighton. However, Birdsall said, Wittenborg will eventually aspire to offering its students a triple degree as is currently an international trend. In addition, a certificate was also presented to Amber Chen, a Chinese exchange student, who will complete the final year of her studies in her home country.